Fire, in its elemental form, destroys, leaving wreckage where once there was order and harmony. But, as an equalizer, it also provides space for new growth in its wake, propelling forward resurrection and regeneration. It’s this balance between death and life, ruin and vitality that drives Come Thief, Come Fire — Natalia Zukerman’s sixth studio effort. Come Thief, Come Fire began as two distinctly different EPs – one that was more introspective and acoustic, and one that embraced a larger, cinematic and more lush sound. But soon, drawn by the interconnections between the songs and the overarching theme of growth — of embracing the things we must destroy in order to let go and move forward — the songs begged to be kept together. What’s resulted is Zukerman’s most immediate, heartfelt and compelling release to date. The first half of Come Thief, Come Fire acts as the foundation for the second half — somewhat skeletal, stripped down songs anchored by introspective lyrics and silvery harmonies. 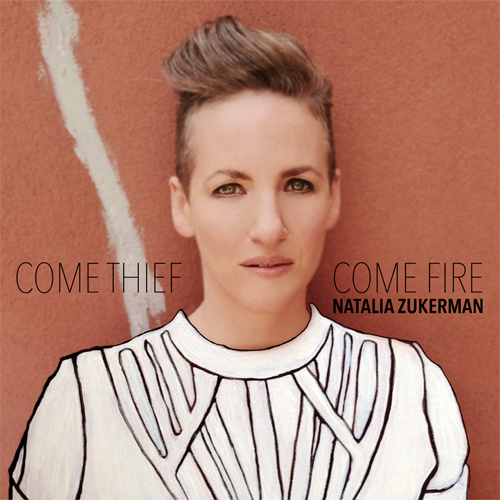 Still, Zukerman flirts with many different styles, from the folk/country of “Courage To Change” and “I Don’t Feel It Anymore” (written with Erin McKeown and AG) to bossa nova on “The Hunter” and saloon-like Americana on “Bucket.” It’s a testament to her ability as an instrumentalist to slide between such different genres without dissonance, demonstrating Zukerman’s masterful command of the guitar. The second half of the album features a broader, more expansive sound, resplendent with vibrant strings (courtesy of father Pinchas Zukerman on violin and his wife Amanda Forsyth on cello), giant harmonies, a full band and inventive production. “Hero” is one of the most immediate, infectious melodies Zukerman’s written yet, “Give” and “Please Don’t” are stunning ballads with perfectly balanced reverb, “One Of Us” and “The Light Is Gone” swell with ebullience, and the breathtaking “What Comes After” — very much the centerpiece of the album — is a fascinating exercise in restraint, giving space to the arrangement that makes it impossible to not stop and take in every subtlety. It’s a moment so passionate and tender, anchored by vivid intensity of Zukerman’s singing and a dazzlingly ethereal backdrop.